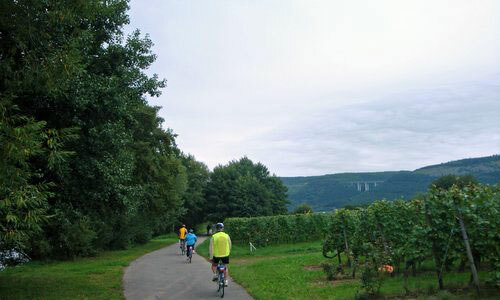 … the hillsides that line the Saar and Mosel valleys but our biking routes run near the river, giving us good views wherever we look. Pretty medieval towns are set between the vineyards and the water, their houses tall to conserve space, their streets narrow but opening to hospitable squares. We spend seven nights aboard our barge, the Allure, which will travel the Saar and Mosel rivers along with us and spare us repeated packing and unpacking. 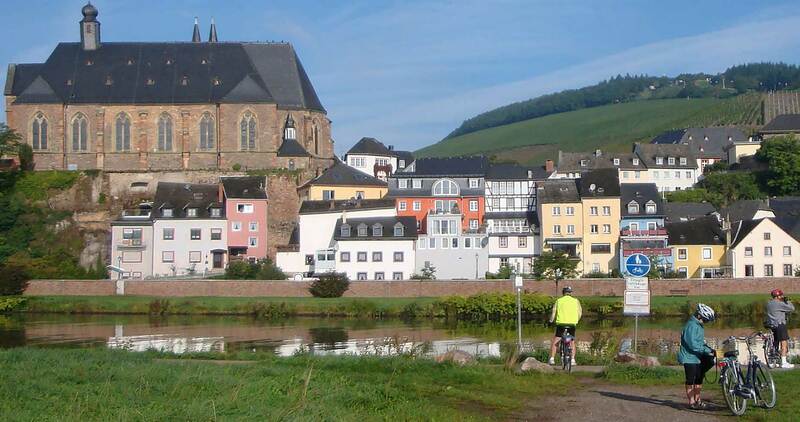 The Mosel is a twisting river, rimmed by the bicycle path we will follow from one delightful town to another. 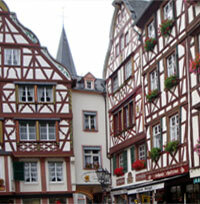 In Bernkastel-Kues many buildings are half-timbered and the fountain in the square sometimes flows with wine. Every day brings new vistas of castles, romantic ruins, and well-cared for vineyards but in the town of Traben-Trarbach we see Art Nouveau-style buildings – now a hundred or so years old, but like a fresh breath after all the ancient shops and houses we’ve admired. The fitting end to our journey is at Koblenz, where the Mosel meets the Rhine. International trade routes have emanated from here for centuries. We will transfer from Koblenz to the Frankfurt Airport, luggage perhaps heavier by a bottle or two. 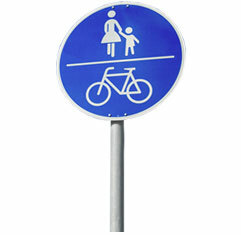 The satisfaction of biking in beautiful country, where the bicycle is an accepted means of transportation, of visiting a series of delightful towns tucked along the river, of enjoying good food and drink – all this will go home with us as well.